I attended the Mother Earth News fair in Puyallup this past May and want to thank you for all your cheese and yogurt making demonstrations!! I was the one who suggested you put photos of other gelatin on your slides other than the conventional brands. The Weston A. Price Foundation recommends a couple different brands of gelatin from organic/grassfed cows. We use Bernart Jensen’s 100% Bovine Gelatin. I wouldn’t want to use gelatin from a CAFO cow. Hope to see some of the healthier gelatins on your slides next year. Thank you, thank you again! I would like information on cheese making classes you will be teaching in 2014. I would like to know what classes you have planned for this summer and the coming fall of 2014. Also, could you provide me with your location? I live in Vancouver Canada. Yes, I would be interested in the September Seattle class and would appreciate it if you would put me in touch with the organizer. Hello Gianaclis, I just thought you’d like to know that I’m sure your excellent book “mastering artisan cheesemaking” has helped me do so well with my farmhouse cheese. Last year at the World Cheese Awards 2013 in the UK, I got a Silver Award and this year, World Cheese Awards 2014 held in London (UK) I was awarded a “Super Gold” which means it was chosen to be among the top 62 cheeses in an entry field of 2,600 or so from over 30 countries. It was a small cheese made from the milk of two of my 4 cows, Dizzy and Patsy. I’m very chuffed! Your piece on Keeping Coagulants Straight comes at just the right time. As a cheesemonger at the Union Square Farmers’ Market, last Saturday a few customers asked detailed questions about different types of rennet. Your concise summary is clearly-written and helpful for those who want to know how cheese is made. Thanks you Roberto! Copy and use as needed. I took your class today and wanted to ask you a question, but didn’t want to get the class off topic. So I was hoping it would be more appropriate to email you. You had mentioned not to raise cows and pigs near each other, I’m assuming that meant dairy goats too. I didn’t get to ask why. I’ve tried researching it, with little results. Can you explain why they need to be kept apart and best distance I should keep them apart. We’re farming 4 acres. Also which of your books would help me better understand this scinario what testing I can do myself, to better protect myself. Our pigs and goats are not in the same pen. However I used our butcher pigs this year to completely work my expanded garden area, which I’m planting in June with sunflowers, corn and other feed items for our goats and pigs. Thank you again for your time today. It was refreshing and very informative. Hi Tammy! Thanks for coming to the class, you all were a great group! So hogs and poultry both commonly harbor bacteria in their guts that can easily contaminate milk and pose human health risks. You can have them on the same land, but be careful to separate chores, and preferably boots. Don’t go into the hog area and then into your parlor. Poultry should be treated the same. The dairy situation I mentioned had the pigs in a pen within the cow pen and right next to where the cows walked through the mixed muck from the pigs and the cows and into the parlor. 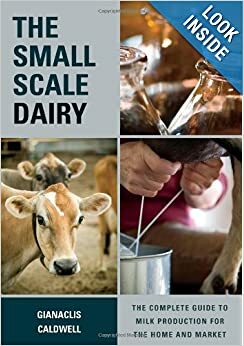 Small-scale Dairy would be the book for you. Thank you so much for the added information. I’d like to order the small scale dairy book. Do you still have some left? Can I order through your website? I don’t have that one set up here for sales. You can get it on Amazon… Hope it helps! I’ve been making Colby and Cheddar for a few months at home. I have your book Mastering Artisan Cheesemaking. I have found that using a pH meter a useful indicator to know when progress to the next stage particularly when to drain the whey and when to hoop. I am looking into making Parmesan. I have searched around for the pH guidelines but cannot find any. Do you have any suggestions for the pH readings for making Parmesan. Hi there, try the recipe on page 288. It is basically a Parm. There are some pH benchmarks in it. Let me know! After vaccum packed cheese has aged could it be waxed? I enjoyed your class in Seven Springs, PA. Love your book!! Making cheddar. Hi Debbie! Do you mean after it’s opened up after aging in a vacuum bag? If so, yes, just before it has dried out enough so that the wax sticks. Thanks for your kind words! Are you ever in Alaska? I would love to see you if you ever were. I’ve never had the luck to visit Alaska. I sure would love to, though! Thank you for the great article on rennet harvesting! We just harvested a bull calf last week and have been drying his abomasum as well. Your photos and descriptions are so helpful! In your Mastering Artisan Cheesemaking book you briefly mention the use of sous vide equipment. Do you have any further experience or information on this? It seems like a great solution but current information is difficult to find. Hi there, no, I’ve only seen it in use in England, but a cheesemaker/chef friend said he is going to experiment. If he does and finds it is useful, I’ll share it. I just started making cheese at home and have a sous vide set up. I had difficulty maintaining temps etc on the stove with just making yogurt so I knew I needed a better way to make cheese. The sous vide set up has helped tremendously! It maintains the water bath temp easilly and allows me to work on other things while the milk is ripening etc. Time saver! I moved to an agricultural community (Wasatch Commons) in Salt Lake City, Utah, where I and some other girls have started a Nigerian Dwarf club and are looking for some certified Nigerian Dwarfs to buy, among many other process steps of preparing and maintaining for which I think one of us has ordered your other books. You are a huge influence. Thank you. Hello I have read through many cheese making books and yours by far is the most informative. Mastering Artisan Cheesemaking reads like a text book. It’s not just a recipe book! I am attempting to make a Pecorino Crotonese but I’m not sure if I should be following your guidelines for Extra-Hard Piquant Cheese (pg 292) or one from Semihard to Hard Cheeses? Crotonese, from what I understand, is more of a semihard cheese. If I make a hard cheese using ewes milk, I’ve essentially made a Pecorinio Romano. Which is not my goal. Crotonese moulds themselves are not meant to have heavy weights. Mostly light pressing if any. Can you provide any guidance as to process and weights? Thanks! If you would email me these questions, I can better answer in that format. My email is my first name @pholiafarm.com I’ll look forward to trying to help with your cheese project! Gianaclis……I attended the Mother Earth News Fair in Topeka and your butter/ cheese demo. Fantastic! You told us that your PowerPoint presentation would be available to view here on your site. I’ve been searching but cannot find it. Can you help? I would like to personally congratulate you as your Gianaclis Caldwell has been selected by our panelist as one of the Top 50 Cheese Blogs on the web. I personally give you a high-five and want to thank you for your contribution to this world. This is the most comprehensive list of Top 50 Cheese Blogs on the internet and I’m honored to have you as part of this! 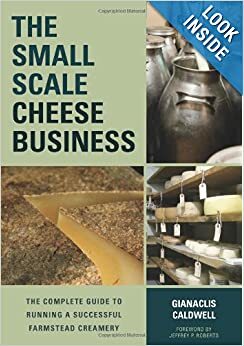 I have read through many cheese making books and yours by far is the most informative. Mastering Artisan Cheesemaking reads like a text book. It’s not just a recipe book! I am attempting to make a Pecorino Crotonese but I’m not sure if I should be following your guidelines for Extra-Hard Piquant Cheese (pg 292) or one from Semihard to Hard Cheeses? Crotonese, from what I understand, is more of a semihard cheese. If I make a hard cheese using ewes milk, I’ve essentially made a Pecorinio Romano. Which is not my goal. Crotonese moulds themselves are not meant to have heavy weights. Mostly light pressing if any. Can you provide any guidance as to process and weights?